A very small, natural cave. Some hidden passage could lead to a wooden altar with some offerings and rare goodies. Since this is the first interior i will have worked on for this mod, i will probably be asking many questions. What tileset should i use for the cave? What are some flora that would be present in the cave? If you haven't consulted it already, (semi)finished content from the most recent main Skyrim file gives many examples of how our caves are supposed to look like. T_Sky_Cave_; T_Sky_CaveRE_ and T_Sky_Terr_RockRE for the shell/rocks. T_Rea_ (Reachman set) would be the most appropriate for denizens (if any) here, and if you plan to make the altar Scamp proposed, T_Nor_Furn_WoodAltar_01 or T_Bre_DngCellar_F_Altar_01 should be used for that. You can also see about using T_Nor_DngBarrow_ for that proposed sacral area, but in a way that wouldn't look like it's a Nordic barrow; see altar in cell -107, 12 or the cave entrance in -109, 6 from main Skyrim file for example. As far as container plants are considered, T_Sky_Flora_LichenCav01/Lichen01 and rust russulas are pretty much mandatory. Other mushrooms (T_Sky_Flora_BksporeCp/T_Sky_Flora_KingBol/T_Sky_Flora_TawnFun01) might be used too. Static cave flora consists mostly of flora_bc_moss_ and T_Sky_Cave_I_Roots_ . Thanks! I'll go ahead and check out some of those caves (I already downloaded all of the files). Another question: When making the interior, do i not put fauna in it? Also do I also not load Skyrim_Main.esp and not connect the door to the outside? You don't add npcs or connect doors when making interiors. 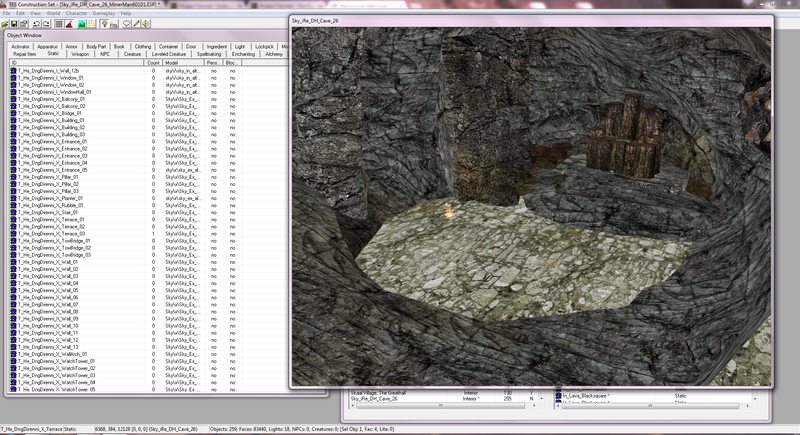 That is done later on when the claim is merged into Skyrim_Main. However, some of our modders, namely berry and roerich, still add npcs to their claims to picture how they imagine the inhabitants of the place to be like. But this is absolutely optional and the npcs are possibly changed or even deleted in the final npcing process. Why are the King Bolete and Tawny Funnel Cap containers but without any ingredients in them? The ingredients for those have not been made yet. Please don't use those mushrooms for caves. 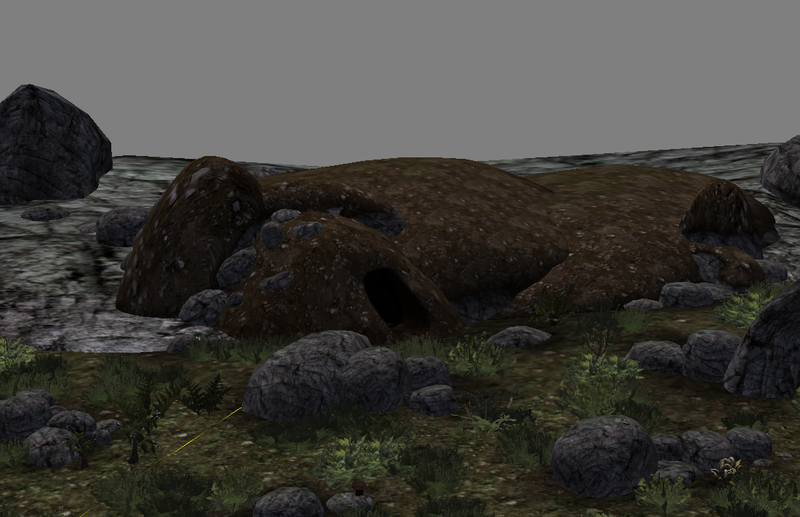 Use rust russula and cave lichen and make sure to look at other caves in the skyrim-main file for reference. Uploading what I have made so far in case of computer malfunction, loss of interest, or unforseen circumstance. Hey, it's a great start IMHO, it would be a pity if you lost your interest for this The entrance looks great already and I like how the altar area is hidden. I'm not sure about the russulas growing fully horizontaly on the walls, but those would probably less stand out when there are more rocks around. Shroom groups could use some lichens as well. I haven't mentioned this asset before, but if you'd like some more variety here, maybe T_Sky_TerrDirtRE03_Plane_01 could come in handy in detailing the shallows? It can be used together with T_Sky_TerrRockRE_BoulderDrt1_ boulders for more variety. I made the rust russulas not on the walls, discovered dirt boulders and added cave lichen before you even made the comment . I didn't know of the dirt plane though, thanks. Also, what do you mean by 'shallows'? Update. Are there better lights than the ones i'm using for the ingredients? I also added an iron ore vein. Are there any lights, if any, that i should use for it? MinerMan60101 wrote: Also, what do you mean by 'shallows'? MinerMan60101 wrote: Are there better lights than the ones i'm using for the ingredients? I use Flame Light_64/Flame Light (for larger groups) myself - it's more vivid and natural-looking than the orange one in my opinion - but I believe we don't have any set convention on that. I'm not sure, but I think we don't use light bulbs for iron ore as a general rule...? Some exceptions would be possible of course. This is finished and ready for review. I don't think there shouldn't be any reachmen in here, just the echoes of their presence. Which section file is this apart of? And this should be moved to completed, right?